Did you know that online registration is now required for upcoming LEGO Mini Build events?! 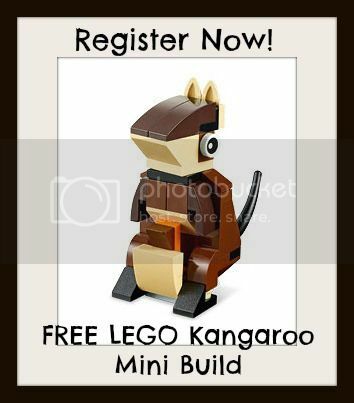 With that being said, registration is now open for the upcoming LEGO Monthly Mini Model Build on August 4th or 5th where kids can build a FREE LEGO Kangaroo Model ! 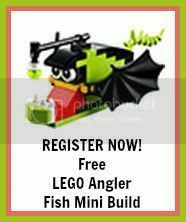 Registration is now open for the upcoming LEGO Monthly Mini Model Build on October 6th or 7th where kids can build a FREE LEGO Angler Fish Model! This event is open to children ages 6-14 only. If you’re a LEGO VIP Loyalty Program Member (You can sign up for FREE here), registration is now open for the upcoming LEGO Monthly Mini Model Build on April 4th and 5th where kids ages 6-14 can build a Free LEGO Baby Chicken Mini Model! Registration is now open for the upcoming LEGO Monthly Mini Model Build on January 9th & 10th where kids ages 6-14 can build a Free LEGO Walrus Model. Registration is now open for the upcoming LEGO Monthly Mini Model Build on February 6th & 7th where kids ages 6-14 can build and keep a Free LEGO Car and Gas Pump Model!